Mughal tents are perfect blend of Indian beauty and Mughal era and are known for their durability. These tents are based on artistic and designing quality and are walled by a symbolic rampart of cloth and recognizes by the patterns, decorations, sizes and fabric. The interior of these tents gives impressive look and are best suited for luxury resort accommodations. They are available in different sizes, colours, designs and patterns. These Mughal tents are designed and manufactured using quality fabrics as raw materials and are made using latest trendy industry designs. They are comfortable to install, easy to wash and perfectly stich. Special lighting increase the beauty of the tent and highlight the colours. Mughal Tents offered by us are ideal for private events or small family functions as they are extremely durable and are waterproof and therefore it will not create any trouble in any kind of party. Mostly used in resorts as well as hotels, Mughal tents give the tourists an experience of contented living. Magical Mughal Tent is intricately designed to give a captivating as well as spell bounded look. White in color, Magical Mughal Tents are ideal provides a touch of elegance and style. 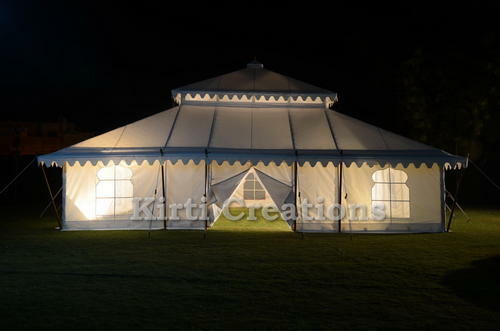 Magical Mughal Tents are very spacious, durable and water resistance that are suitable in all weather conditions.